Salvatore Aiello, the son of Anthony and Mary Ann Cassella Aiello, was born February 26, 1944 in Herkimer, New York. 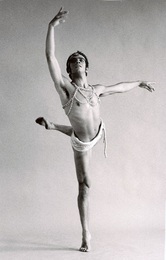 1952 Began studying dance at the age of 7 with Chris-Eleanor School of Dance in Herkimer, NY. 1959-1961 Performing experiences with the Tri-City Ballet Guild and Northeast Regional Festivals. 1961-1962 Toured Europe with the American Festival Ballet of Rhode Island at the age of 18. October 14, 1995 Salvatore Aiello died at the age of 51 in Charlotte, North Carolina. for outstanding contribution to Dance. “As a friend of his I shall miss him; as a peer we shall all be poorer for his absence. We are lucky to have met him. We are lucky to have worked with him. dance development, and love to our fellow man." Documentary of "That's So Sal!" by Stuart Grasberg is available for viewing by DVD request only.